Having finally reached the point of assembling the motor for my 1913 2 3/4 hp overhead-valve Bullock Precision, I was confronted by a rather sad selection of parts from which to assemble the valve gear. The Precision cam chest is compact, with one shaft carrying the timing gear and the two cams, and two long cam followers. I was lucky enough to have two cam wheels to choose from (even if one was badly worn), but the followers were feeling a little tired. Bent, worn and tired, to tell the full story. After some judicious welding, bending and grinding, and a new set of shafts (informed by the illustration above from Rankin Kennedy's 1913 The Book of the Motor Car), the followers came together with the one serviceable cam to form a reasonable set of valve gear. 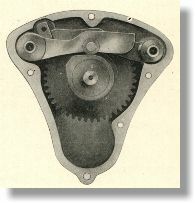 As the engine turns, the valves now open and close - indeed the motor runs - but the valve timing is clearly some way from the maker's specification. But what sort of valve timing should one expect in a sporty ohv veteran? I really had no idea, and since the art of valve timing was still in its infancy before the first war, anything seemed possible. As a first step towards sorting out the motor, here's some numbers I found for valve timing of sporty pre-WW1 veteran machines. Touring veteran motorcycles of the time rarely ventured far from the naive text-book valve timing (exhaust closes as inlet opens very close to top-dead-centre), but from the table below you can see that experimentation was rife. The non-Rudge information comes from the delightful 1913 Temple Press publication Secrets of Tune. The most "modern" timing belongs to the unknown R. Croucher's 3 1/2 hp Kerry Abingdon (see note added below). By his own admission he had done "...very little competition work so far as speed events go...", and I know nothing of his subsequent career. Good timings, though. The Bullock? Well it seems the dwell on the exhaust cam is significantly too long. It should be possible to rework the exhaust follower to get it back to something more reasonable. But then there's the heat treatment problem. We will work something out. Martin Croucher is hot on the trail of his grandfather Robert Croucher's motorcycling exploits. 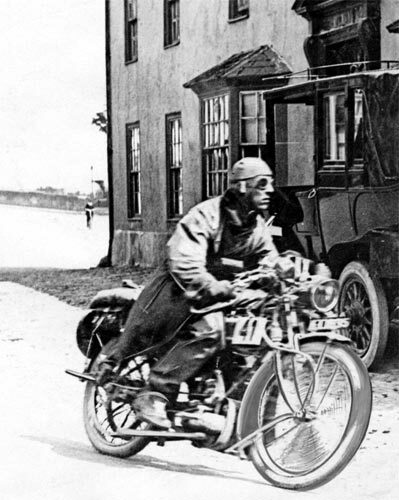 Robert Croucher, died January 1947, Carshalton, Surrey, UK, receives several mentions in The Motor Cycle before the first war, when his outings included the London to Edinburgh Trial, June 11, 1914. Martin sends this very atmospheric shot of his grandfather on his Kerry Abingdon in that event (Classic Bike Guide, June 2014). If only we had a video clip we might hear the crack of his exhaust owing to his very modern valve timing! Apologies to Martin for using the adjective "unknown" to describe his grandfather. No longer.